Enter the user name you wish people to see when mail arrives from you (don't just use your first name) then enter your assigned e-mail address and password. 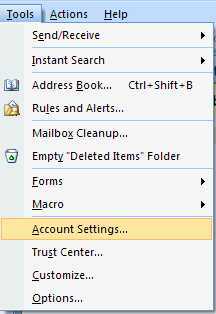 To collect and send mail just click on "Send/Receive"
Use the following instructions to set up your account in Microsoft Outlook v5. Click the Add button and select Mail from the popup menu. Type in the name you want to appear on your messages. Select 'I already have an e-mail address...' and enter your assigned e-mail address. 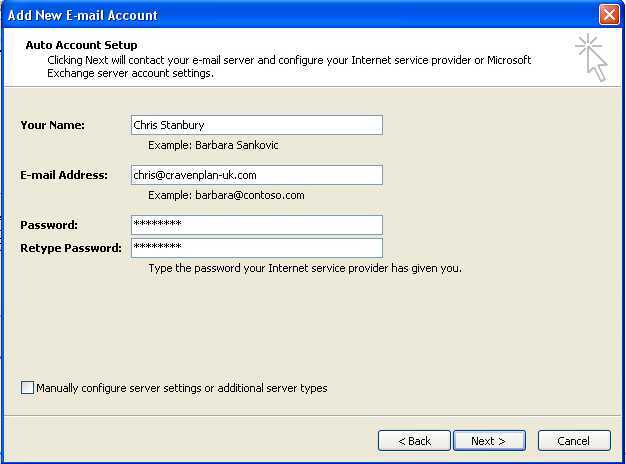 For 'Incoming mail server' enter "mail.cravenplan-uk.com"
Your 'Outgoing mail server' is your ISP's mail server, used for outgoing e-mail. (If you are unsure of your ISP settings, please call us on 0800 135 7304 and we will try to help you). Enter your assigned account name (your e-mail address) and password. Do NOT tick 'Log on using secure password authentication'. 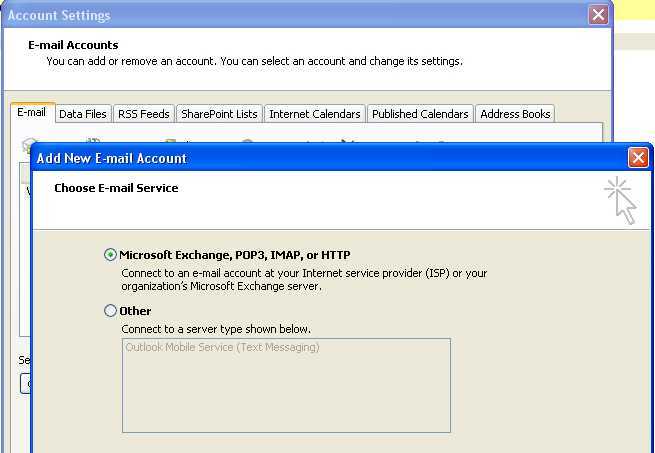 These instructions are for Outlook Express Version 5.x. 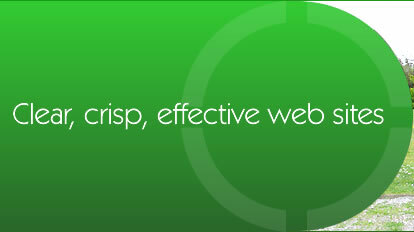 Click Mail and select from the list your Cravenplan E-mail account (it might be called "mail.cravenplan-uk.com"). In the "Reply address:" box enter your E-mail address (e.g. "johnsmith@swallowcliffe.com"). Your alternate reply address has now been successfully set up. 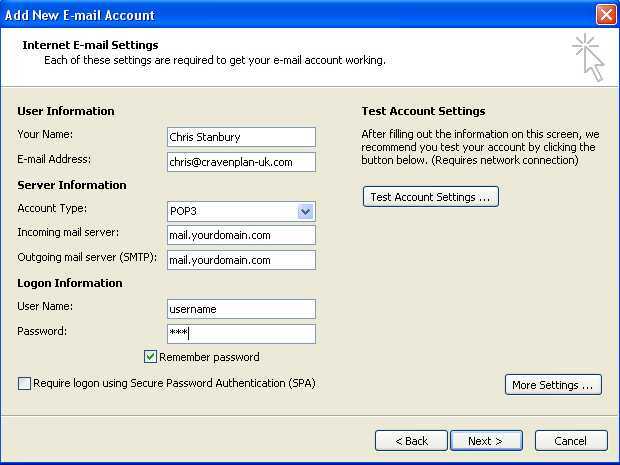 After following these instructions you should be set up to collect your E-mail from your new account. Congratulations. You then need to find the "my outgoing server requires authentication" option often found from the options menu. Enable "my outgoing server requires authentication" and select the "user name and password is different" part so you can now enter your BT user name and password for the outgoing server. Once this is done you can receive email from the cravenplan server and send via the BT server. A final note, as a further tightening up of security a lot of ISP are starting to require the email address on email to match their domain. 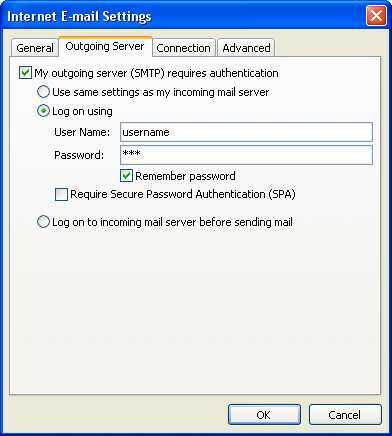 Hence you will have to enter your BT address as the default email address on the email account in outlook you receive the mail from. To prevent this being a problem you can enter the cravenplan supplied email address in the reply to field in the options so that people will reply to the correct mail box.